WASHINGTON — Samanthan Power has been confirmed by the U.S. Senate to be the newest ambassador to the United Nations. 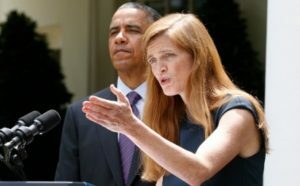 Reuters reports that Samantha Power will succeed Susan Rice, who was of the Benghazi cover-up fame. Her controversial stance on humanitarian interventions have gotten most conservatives upset and placated liberals. This philosophy, R2P or Responsibility to Protect, entails American troops potentially being sent to mediate humanitarian crises and puts American lives at risk and in danger. She made controversial remarks in 2002 in saying that the U.S. Army should be sent to mediate the Middle Eastern conflict between Israel and Palestinians, especially when Israel will be close to committing genocide and will be a move to protect the Palestinians. The Senate voted her in by a 87-10 margin.